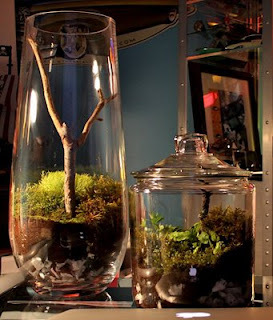 I love the lush healthy moss growing in this terrarium at The Bob Blog. Pieces of wood make great naturalistic additions to your terrarium. If you are concerned about bringing critters in on a piece of wood from the wild you can buy driftwood from the reptile section of a pet store. I love the idea you had dedicated on mosses & I have been hunting them to find out the different varieties of it. So far I had managed to collect 3 different types. Right now the challenge is the display. They are too small to be added in the garden and the chances of it to be forgotten and lost. I did collected some moss - cleaned and washed and poured sugar water on them. Few days later - fungus started cobwebbing on them!!!!! Arghhh!!! Now - I'm thinking should I throw all of them away or keep them and see what is the next development. Hi James thanks for your comment! If you are getting the cobweb fungus on your moss it's time to trash them and rinse your container with hot water and bleach! That mold is hard to get rid of. I have heard the reccomendation to add sugar water or buttermilk to moss when you are attempting to make a "moss shake" out of it (ie. blend it up with water and milk and then pour it on a wall to make moss grow on a wall). However you DO NOT need to add sugar or anything else to living moss chunks to encourage growth. I had trashed the moss - seemed like the fungus had overwhelmed the whole moss thing. I guess the sugar water was the culprit. If this is the case - what would be the best thing to do if I want to have a big rich chuck of healthy moss? I think your best bet is to use moss you can find around your place or look into purchasing some plants or moss from an online retailer. 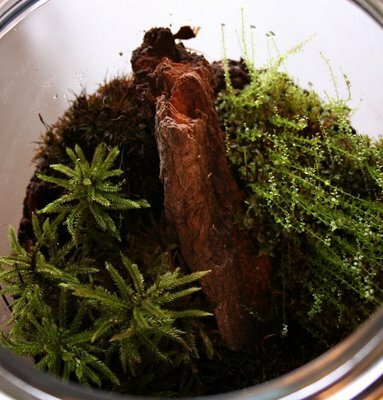 I would also reccomend cleaning out your whole terrarium with hot water and maybe a little bleach and then starting with fresh soil, substrate etc. as that fungus can be quite invasive.